I was thinking that some kind of bend tool would be kind of neat. I'm not sure if there is a place we're supposed to put suggestions, so I'm just putting it here. Here is my suggestion about how you might choose to implement the tool. A. First you have some "clay" that you want to bend. In this case it's just represented as a bar, but it could be any shape. B. Next you would take the "Bend Tool Area Selection" and paint a transparent selection (green) over the area you want the bend to take place. So the bending only happens to the portion of the clay that is encased inside the selection. C. Next you place your pivot point (red) inside of the transparent selection. This point represents the apex of the bend. D. Finally you 'grab' the clay on the outside of either side of the selection area and then move your hand to bend the clay in the direction and angle of your choice. The clay within' the selection area is bent (stretched or compressed as necessary) while the areas outside the selection remain normal. 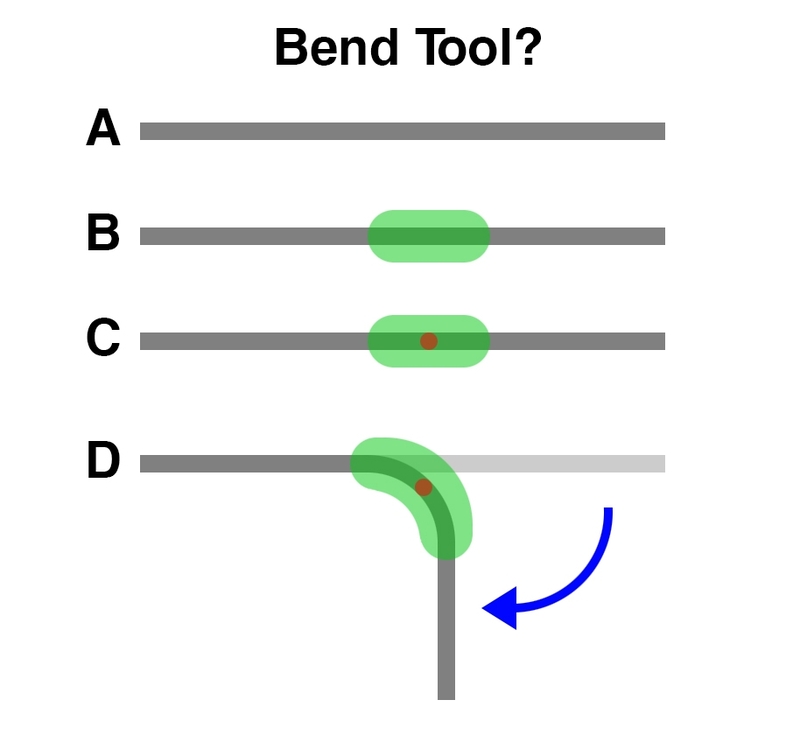 Which ever side you do not grab becomes the "anchor" and remains in place during the bending process. If you leave the selection and pivot in place after performing the bed, you could grab the other side of the clay and bend that as well without having to create a new selection area and pivot and the other side of the selection would automatically become the anchor. Thanks for your time. I hope this suggested feature request is useful to you or inspires you to come up with a better way of doing it. Keep up the great work! This is an amazing piece of software and something I've been dreaming about having and thinking about for over 25 years! I see what you're getting at here, and I can imagine if we did it right, it'd give the surface a nice feel, like you're actually manipulating a solid thing with some physics. As it stands, you can get a coarse approximation to this by just slicing the layer with cut, moving the cut part in layer manip mode, and merging them back together; you have to sculpt up the connection to refine it, but honestly, you'd lose enough detail in the stretching and resampling that would happen in a bend you'd have to go clean up that junction anyway. I think if we were to add a tool that did something like this, in terms of impact we'd probably do something more like the ZBrush move tool (grab a big chunk of clay and drag it, it moves & reorients and stretches / deforms the connection to clay outside the area of effect so it remains continuous.) That's still a ton of work to get right, too, so it's probably not happening super soon, but it avoids the multi-step stateful problem and gives you the ability to reorient clay in useful ways. Hopefully this doesn't come across as dismissive - I appreciate you taking the time to write this up & I'm just explaining my thought process aloud. I don't take that response as dismissive at all. All your points were absolutely valid. I just found myself wanting to bend things from time to time and was thinking of a way that could be achieved. The idea of cutting and merging sounds like a good work around for a lack of a bend function. I'm extremely happy with how Medium works as is, but I'm definitely looking forward to what you folks add to it going down the road. Keep up the great work and I really appreciate that you are so responsive in the forums to our feedback.